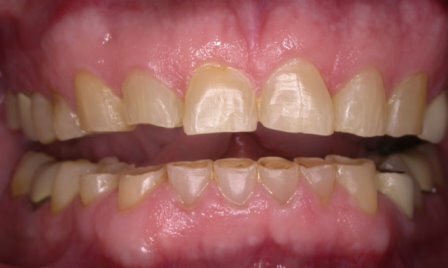 This 55-year-old patient is a chronic bruxist. 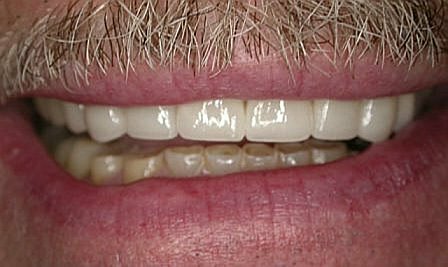 Over the years, his teeth got severely worn down from his parafunctional habits. Phase I of his full-mouth reconstruction: 7 porcelain veneers and 1 porcelain crown on his upper front. Observe the dramatic improvement in the overall esthetics. 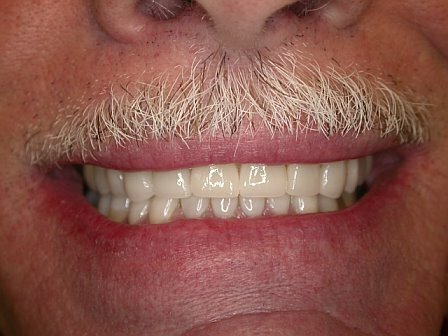 Phase II of his full-mouth reconstruction: 7 porcelain veneers and 1 porcelain crown on his lower front. Phase III (final phase) of his full-mouth reconstruction: 4 porcelain onlays and 2 porcelain crowns on his lower back teeth. 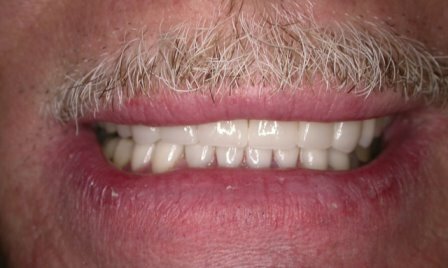 At the end of the treatment, the patient is thrilled about his winning smile!